THIS IS OWYHEE PRE 2013. New roundup can be found on our main page. When we are talking about cases involving wild horse and burro issues (particularly issues surrounding handling of animals) writing (and researching) a case, obtaining the temporary restraining order (TRO) and Preliminary Injunction, and gathering and preparing documentation and collecting declarations to support the argument are often done at a frantic pace. As an example, if an issue is documented that raises concern, attempts must be made to address issues through other means first. If those efforts fail, and there is no action made by the erring party at improving the situation, the only option at that point is to address the issues through the courts. Often you find yourselfunder the gun of time. Many operations take place rapidly and you must create your case before the conduct in question ends, e.g. before a particular roundup ends. However, new case law (created in a case carried by Wild Horse Education (WHE) has effectively demonstrated that conduct is cyclical, and likely to reoccur, as Bureau of Land Management (BLM) roundups repeat in each area in any given time frame. 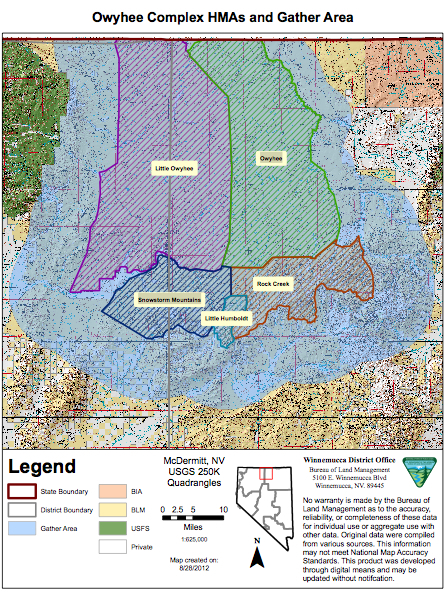 In addition, BLM can operate on plans that have not been revised to correct the contested actions, as is the case with the Owyhee Complex of roundups in Nevada where BLM is operating on a Record of Decision that spans ten years. Over the span of the execution of the ten year plan, BLM has not revised the plan to correct the issues presented to them through all avenues. 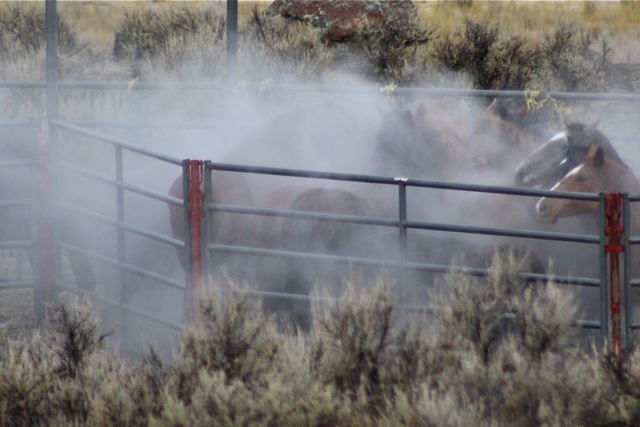 If you have been following the Owyhee case on our WHE Blog, Facebook page and website, you know that WHE was at the first phase of operations in the Owhyee roundup, almost daily, and documented issues that raised serious concern. WHE documented horses being run into barbed wire, excessive and unjustified hotshot use, foals literally being run to exhaustion, and horse run until they were steaming in extremely cold temperatures. The distances these horses were stampeded exceeded ten miles. The next scheduled roundups in the Owyhee Complex operation could require stampeding horses at distances as much as twenty five miles to reach the chosen trap location. These are Issues that WHE, and the public, through a letter writing campaign, made every possible attempt to rectify. 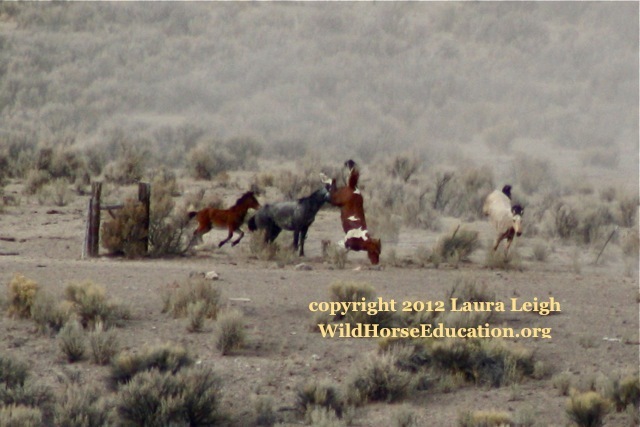 (Reno, NV) Shortly after a hearing ended in a case brought by Wild Horse Education’s founder Laura Leigh, the Honorable Judge Miranda Du issued a restraining order to conduct at the Owyhee Complex wild horse roundup. (Reno, NV) Today a lawsuit was filed in Reno Federal District Court against conduct at the Bureau of Land Management (BLM) wild horse roundup operation in northern Nevada. 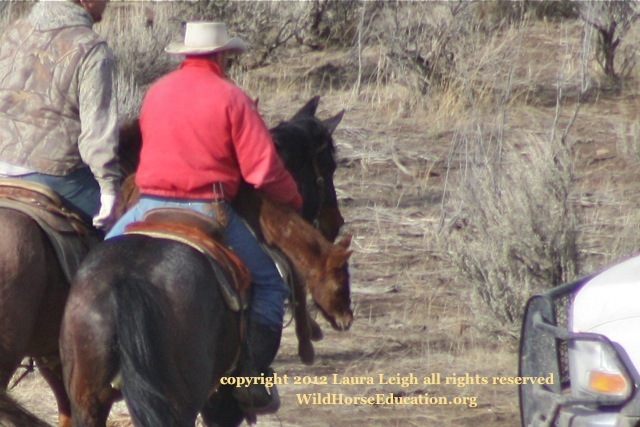 The case was filed by Reno attorney Gordon Cowan for Plaintiff Laura Leigh, founder of Wild Horse Education (WHE), and addresses a ten year removal plan in the Owyhee Complex. Leigh witnessed the majority of operation days during the first phase of the plan. In court documents Leigh states that inappropriate conduct was observed repeatedly including: routine use of electric cattle prods, wild horses driven through barbed wire, operations in sub-freezing temperatures. In one instance wild horses were documented being driven into a barbed wire fence and four animals became entangled, two literally crashing onto their heads. In the past forty years BLM, the agency tasked with managing these protected American heritage animals on federal land, has failed to implement any humane treatment standard for animal care and handling. Over the course of the last two years BLM has been making claims that a policy will be in place or creating operation “memorandums” that are ignored in practice. After a Federal Restraining Order was issued, when a pilot apparently hit a horse with the helicopter skids in August of 2011, BLM did an internal revue that revealed a host of inappropriate conduct. The state of Nevada then issued a memorandum of expectation for conduct. The BLM National office has been promising the public a policy, and giving deadlines for implementation that come and go with no forthcoming policy. Witnesses continue to see no change in handling of wild horses by the agency. Can you see the barbed wire? note: I am going through video and stills and trying to formulate what to write about. Let’s start with: Today was not the same as yesterday. Day three and I can see that patience is starting to wear thin. I am struggling with memory and digital storage for editing. So I am going to give you a series of stills. If a picture is worth a thousand words… here is an entire volume. 4 horses got tangled in barbed wire as pilot tried to push horses through gate onto the private property where trap was set. After being run into the trap and his family trailered off the range (to leave him alone at the trap) the chopper immediately brings in another band. Baby tried several times to escape. There is no area to access any handling at holding. We were given a brief opportunity to photograph. I was weaned today. I was also loaded onto trailer with adults. Please support this work if you can. We MUST continue to make a stand for a standard of handling. We MUST continue to be a presence at management meetings and we must continue to be their voice in court when needed. PS. BLM made a “mistake” on the count. Day 1 was 40, not 41. Yesterday was 70. Today was about 60. To date aprox. 116 horses have been removed from the range: Monday total 41, today about 75 (not official count, no count numbers were given to Public relations each run). Removal target 847 total. Body condition primarily 4 and 5 (Henneke scale). Access to view loading was adequate, except heavy tarps were used (not black screen shown to public in Denver 2010 BLM workshop). First run horses came in sweaty and slightly steaming. (Note: Winter of 2010/2011 saw high number of deaths from respiratory illness. Winter had roundup days that began below 20 degrees). All but the last run showed awareness of pressure. Last run animals were pressured and confused. Loading also showed less pressure than observed in the past. Hopefully ability to observe continues to see if this is an isolated event. Two injuries noted: Grey with a limp and a young buckskin that appears to have gone through, or into, barbed wire fencing, during last run. (note: animals need to be driven through gates as the trap is located on private property). Two horses escaped the trap: one young mare vaulted the panel, one horse (stallion?) evaded the jute. Both horses were not pursued. Observation at temporary holding was practically non-extistent. BLM said they would post photographs of injured mare on their site. Day began at 19 degrees, cloudy and cool. Rain expected for the rest of the week. Video and further observation reports will be posted. If you tube doesn’t work I’ll check bugs later. I have to run……. more work to do. Anyway, note fences. Is it possible that the BLM misleads? Or just doesn’t have the information? The guy in the video that says he “hasn’t been up there,” is the field offfice manager.